Parents and caregivers know that sippy cups are a fun way to get your little one to drink the necessary amount of water they need. However, with so many options, how can you choose the best one? The best toddler sippy cup will be leak proof, spill proof, comfortable to hold, easy to clean, and BPA-free. Colorful designs and branded characters are fun. Still, don’t judge a sippy cup by its packaging. Quality materials matter as well and if you can get an eco-friendly, plastic-free sippy cup, it’s all the better! This 10-ounce sippy cup from Gerber is shaped like an hourglass which makes the cup easy to hold and prevents tipping. A label area allows you to write your child’s name on their cups. In this way, you can prevent mix-ups at daycare or the park. The texture of the colorful cups also makes them easy to hold. You can toss this BPA free cup into the top rack of the dishwasher – valve and all – for easy cleaning. Fun Grips sippy cups feature a hard spout that stands up to chewing. The patented Seal-Zone Technology creates a cup that will not spill, leak, or break. Unlike the traditional sippy cups with a spout, this one is somewhere between a spout and a regular cup with a 360-degree, spill-proof drinking edge. The stainless steel design is easy to clean and sanitize in the dishwasher with no small valve parts to lose. The cup includes a colorful silicone top that seals itself when your child stops drinking. Apart from that, it also has a matching lid that keeps the drinking edge sanitary when not in use. 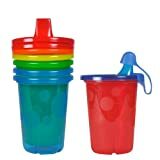 The 10-ounce Miracle sippy cup has insulation and a vacuum seal that keeps drinks warm or cold for up to 15 hours. This gives you peace of mind that the milk you pour before you leave in the morning will be just as good and cold at lunchtime. 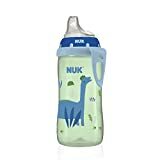 The 10oz Nuk Active cup features a silicone spout which makes it ideal for transitioning from a baby bottle to the sippy cup. Also, it comes with a cover to keep the spout clean in your diaper bag or in the car. The cup is ergonomically designed to be easy for little hands to hold. Moreover, it includes a convenient carrying clip. Just clip it onto the outside of your diaper bag, purse, stroller, or even on your toddler’s pocket. 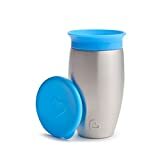 The Active Cup is made of top-rack dishwasher safe, BPA-free polypropylene and the spout is made of silicone. Any parent can tell you the awful experience that is to find an expensive sippy cup hiding in the back of the car. Cleaning a cup that’s been sitting a while is no easy task. Therefore, The First Years took a stab at creating a reusable, yet disposable sippy cup and they totally hit the mark. The cups are spill proof and leak proof. They come in bright colors. Moreover, they have easy snap-on lids, and no valves to clean. The package of assorted colors includes one snap-on cap. 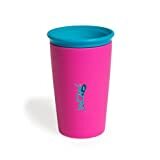 The WOW Cup for Kids holds 11 oz of their favorite beverage in a brightly colored lid and cup combinations. The 360-degree drinking edge has a Uni-Flow design. 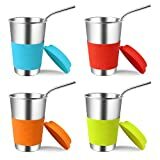 It allows your toddler to drink from any part of the cup, without searching for the spout. The absence of a spout equals less chewing temptation. Also, it allows the child to develop proper muscle memory for drinking with ease when transitioning to regular cups. All parts of the WOW best toddler sippy cup are dishwasher safe. They are made of safe, quality materials without any BPA or phthalates. The innovative self-sealing lid design closes when your toddler stops drinking. You can take it apart for thorough cleaning. Recommended: check out the best dish soaps to safely clean all of these toddler sippy cups! Probably the most popular sippy cups for toddlers, the Philips Avent are not just intuitive, but veyr cute and attractive to your little ones. Philips and Amazon offer a 100% leak-proof money back guarantee – which honestly is kind of awesome. 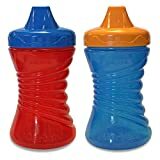 The pack of two allows you to mix up the colors and keep your kid interested in the bottle. As they should – dentists throughout the US recommend the cups since they enable healthy oral development. And lastly, it’s BPA free, dishwasher safe, and the straw is very bendy allowing for easier sipping. 🍼 Recommended by 90% of 200 dentists across the U.S.
Kereda makes toddler sippy cups that are more for older toddlers. These tumblers are greater for kids transitioning to regular cups. And they’re eco-friendly. So much wasted plastic goes into the sippy cups we’ve talked about until now. It’s about time to talk about these stainless steel options – with actual stainless steel straws! But they’re still fun to see and drink with! They come with lids and sleeves that are interchangheable so you can mix up the colors. Of course, the rubber on the lids and sleeves is BPA-free. And the best part is that these don’t look too kiddy and can easily carry on working well as actual cups for adults. 🍼 Great for adults too! Great for toddlers over the age of 3! These tumblers are precisely like the previous sippy cups for toddlers, with the added bonus of tips for the straws. The tips make sure that dropping them won’t spill what’s inside. However, these tips work mostly for kids over 3 since they are a choking hazard. If you’re concerned about this, you can just skip this product. But we appreciate it since they solved the biggest problem of the previous entry with a quick, simple solution. Honestly now we could argue that this one’s the best sippy cup for toddlers to come out in recent years. The tumbler’s design makes sure that you can’t possibly spill out of it. Even if you turn it upside down! How? With the innovative valve straw design. It comes in 6 very lively-colored versions and it also still looks cool enough to be great for adults as well. You can get it by itself, the full 14-oz of it! Or as a 3 pack. Last but not least, it comes with a lifetime guarantee that covers material issues, workmanship issues, defective products overall, as well as replacement lids and mugs! 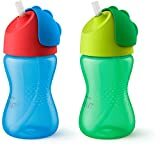 Now I know we said the previous entry might be the best, but this one is actually THE best sippy cup for toddlers for several reasons: it’s reasonably spill-proof (more than most entries on the list), and it works with a very smart valve under the sippy bit. The slight hourglass shape makes it easy to grip, and it weighs enough so it has some weight to it so toddlers can’t shake it around too much without tiring. It’s also designed for babies 12 months and up, so it works for more scenarios than a lot of the products mentioned earlier (which were 3 years plus). 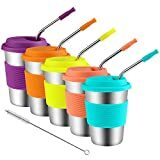 Other than that it has mot of the features of the previous entries, it’s BPA-free, it comes in a pack of 4 with various designs, and you have the options of blue and pink bottles. Growing up and moving on from the bottle is an exciting, but sometimes messy milestone. Finding the best toddler sippy cup may take a little trial and error as children have different preferences. However, this list will point you in the right direction of highly reviewed cups kids and parents both love. Leak and spill-free travel and meal times are in your future with the right sippy cup! 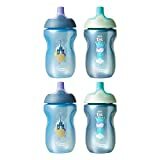 Which do you think is the best toddler sippy cup? The Tommee Tippee ones are probably the best for younger kids, but I’d probably pick the Contigo ones now. Share your own opinions and experiences in the comments!